You're doing what you need to do to protect your digital data from identity theft, but are you doing what you need to do for paper products too? With identity theft continuously on the rise, it is more important than ever to protect yourself and your company by properly disposing of confidential documents, and documents with personal information on them. 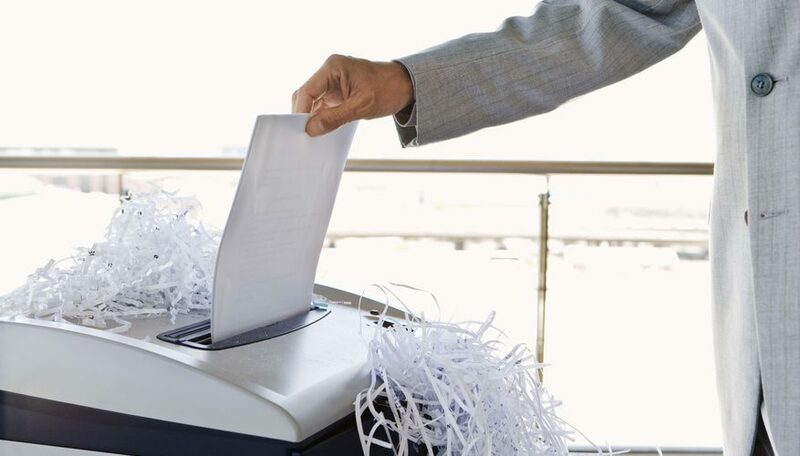 Protect your business and protect yourself with this all-you-need-to-know guide to paper shredding and document destroying solutions. What many companies have done in the past is hire a portable shredding service once they accumulated enough waste. A truck will come to their location and typically would charge by the box of waste to be shred. While these shredder services were immensely popular in the past, the trend has declined due to the insecurity that many of them provided. Some portable shredder services use shredders that are rated at just a security level 1 or 2... this means that your documents are being shred into strips (not confetti cross-cuts) ranging in size form 1/4” to 1/8” wide, leaving your letter size documents in as few as 34 long strips (a 34-strip puzzle is a piece of cake to put back together). But if you take your security into your own hands with a shredding machine, you eliminate that risk. 1. What security level do I need? Shredders can be purchased in security levels ranging from one to six. You will need to consider the kinds of documents that you plan on shredding to determine the proper level for your specific needs. a) Level one security is used for shredding general internal documents, such as those with billing addresses, shipping information, birthdays, etc. Level one shredders cut strips that are 1/4” wide. b) Level two is also used for shredding general internal documents, but will cut your paper into 1/8” wide strips. c) Level three is the lowest level that will cut your documents into cross-cut confetti pieces close to 5/32” x 1-1/16” in size. This option is used for shredding more confidential documents and is one of the most popular options for small offices. d) Level four is used for highly-sensitive documents and will shred your documents into cross-cut confetti pieces close to 5/32” x 9/16”. e) Level five shredders are espionage safe for extremely high security demands. f) Security level six shredders (also known as Government shredders) are NSA/CSS 02-01 specification-set by DoD for the secure destruction of Classified through Top-Secret COMSEC. Typically only government facilities use this high-security shredder. 2. What kind of materials will I shred? Many shredders will accept materials other than paper, such as CDs and DVDs, Credit Cards and more. Figure out what kinds of things you will shred before buying. If you get a machine that is strictly a document-shredder, then putting credit cards or CDs through it can damage the machine, often times beyond repair. 3. How often will I shred? Many shredders are manufactured by volume and, therefore, are only meant to handle a certain number of sheets per day. Volume is important so that you do not get a machine that it too fragile for your usage, or too robust. Most shredders only require basic maintenance, such as oiling the blades to keep them sharp. You can use any standard machinery oil, or shredder oil, and spray it onto both sides of a sheet of paper. Then run the oiled paper through the shredder to coat the blades. Run a couple additional blank sheets to make sure the oil is evenly dispersed. Accessories are never required, but waste bags or boxes can help make clean-up of shred-waste easier. Don’t leave your security in someone else’s hands... protect your business and protect yourself with a document or data shredder. If you need help finding the perfect shredder for you or your company, call us at (866) 537-2244.